Lexus unveiled the red LFA Roadster concept back in 2008 at the Geneva Motor Show but the car never evolved into a production model as Toyota stopped development blaming shaky market conditions. However, back in 2012 a white open top LFA made a surprising appearance at the Tokyo Auto Salon but most likely that wasn't built/converted by Lexus as it had a rather dodgy roll bar indicating it was a custom project. 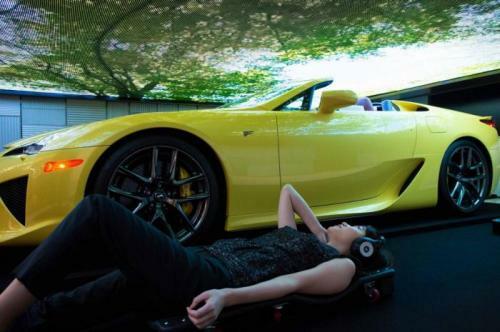 Now, a yellow LFA Roadster is being exhibited at Media Ambition Tokyo, an event organized in the Roppongi Hills building complex which showcases "advanced technology art." The supercar features in a video & sound installation entitled "1,220" which likely refers to the LFA's 1220mm height. Visitors have the possibility of getting inside the car while above the LFA is a massive screen displaying a variety of locations, trying to enable the person behind the wheel experience the sensations felt when actually driving the supercar. Details about the vehicle are not available at this point but it's certainly not the original red concept as that one had cameras instead of mirrors and lacked turn signals. In addition, the headlights had a different shape and lacked washers while the front bumper was also different which makes us believe this is a tuning job.